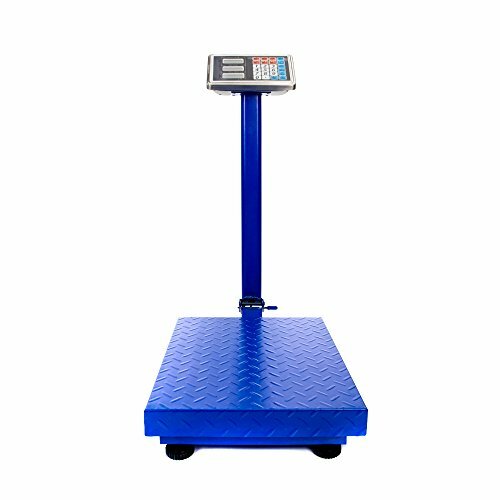 The Electronic Platform Scale is low cost and highly accurate measuring equipment which is most suitable for super markets, grocery stores and other retail outlets. This scale is made using highly accurate and precise sensors. It is with capacity to store up to 5 unit prices and 99 accumulation memories. Wide platform holds large packages while long extendable cord allows user to read package weight easily no matter how big the item. It is a versatile machine, because it also runs on rechargeable battery in case of lack of mains power. The scale will also automatically switch off when it is in non-use condition, to save power. Digital postal scale has a high capacity of 660lbs / 300kg. Minimum Reading of 2.2lbs. Ideal for all your shipping, mailing and weighing needs. 1.ZERO THE SCALE:When there is nothing on the scale but reading is not zero, press the zero key to turn on the zero indicator.2. weighing:Ensure that scale is in zero position and zero indicator is plowing, place an item for weighing on the pan, the weight of the item will be showed on the weight window. 3. tare:Put container on the platter, once the weight reading is stable, press the tare key, the tare indicator will be on and the container;s weight will be deducted. When it is time to clear the tare, take off the container, and press tare key again.4. overload warning:Please do not add item that is over the maximum capacity, when the scale is ringing an alarm, remove the item on the platter to avoid damage to the load cell. 5. unit price setting:To trade with the tcs scale, it is necessary to setting a unit price of the goods, then use this unit price to determine how much valye of the goods which placed on the platter.6. When the scale is displaying the weight of the goods placed on the scale, set the unit price through numeric keys, set unit price is showed in unit price window display, total price window display shows the total price of the goods. To cancel the previous unit price, press C key. If you have any questions about this product by OASIS FOX, contact us by completing and submitting the form below. If you are looking for a specif part number, please include it with your message.